American Samoa with its capital Pago Pago is located in Oceania (Oceania, group of islands in the South Pacific Ocean). It covers some 200 square kilometers (slightly larger than Washington, DC) with 51,504 citizens. English, Samoan and Tonga are the languages commonly used by the people in American Samoa (consider regional differences). This country shares no land borders with another country. American Samoa is a group of islands in the South Pacific Ocean that lie about halfway between Hawaii and New Zealand and about 100km east of the island country of Samoa, which is part of the same archipelago. The islands are frequently referred to as Samoa, which is the name of a separate island, and independent country, that used to be known as Western Samoa, that lies about 100km west of American Samoa. Also the whole island group, including Samoa, are often identified as the Samoan islands. To reach someone American Samoa dial +1-684 prior to a number. The local cellular networks are operated on 850 MHz, 1900 MHz, 3G, 4G. Websites typically end with the top level domain ".as". If you want to bring electric appliances (e.g. battery chaarger), keep in min the local 120 V - 60 Hz (plugs: A, B, F, I). The sign for the locally used currency Dollar is USD. 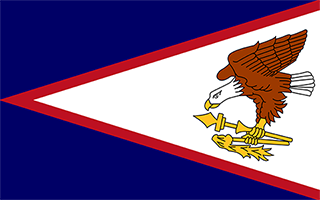 Blue, with a white triangle edged in red that is based on the fly side and extends to the hoist side; a brown and white American bald eagle flying toward the hoist side is carrying two traditional Samoan symbols of authority, a war club known as a "fa'alaufa'i" (upper; left talon), and a coconut fiber fly whisk known as a "fue" (lower; right talon); the combination of symbols broadly mimics that seen on the US Great Seal and reflects the relationship between the US and American Samoa. Settled as early as 1000 B.C., Samoa was not reached by European explorers until the 18th century. International rivalries in the latter half of the 19th century were settled by an 1899 treaty in which Germany and the US divided the Samoan archipelago. The US formally occupied its portion - a smaller group of eastern islands with the excellent harbor of Pago Pago - the following year.